Font hinting is the use of mathematical instructions to adjust the display of an outline font so that it lines up with a rasterized grid. At small screen sizes, with or without antialiasing, hinting is critical for producing a clear, legible text for human readers. It is also known as instructing. Hinting alleviates this problem by ensuring that pixels are carefully placed to deliver good legibility and usability. Hinting will not affect the quality of print output on all but the lowest resolution of printers. As you can see at the top, font test with hinting (lower rows) and without hinting (upper rows) at 100% (above) and 400% (below). Note the increased edge contrast with the hinted text but more faithful character shape in the unhinted text. 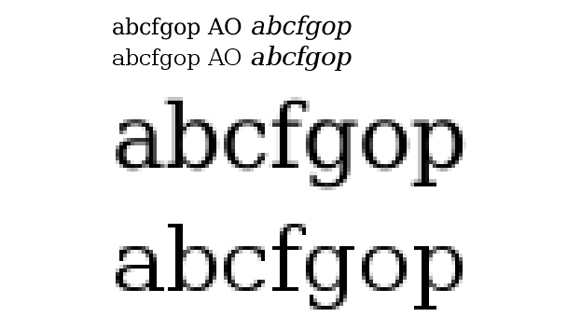 Depending on the font format being used, the hinting is more or less elaborate, but always recommend the use of TrueType (TT) or TrueType-based OpenType (OT) fonts because of the full control over pixel placement given to the font engineer. The most reliable appearance of hinting is experienced on Windows systems in office applications. Some design programs also respect the settings by the font engineer but, unfortunately, many professional design programs simply ignore hinting and screen display settings altogether, aiming to deliver a good approximation of print design at the cost of screen clarity. You are reading “ Font Hinting ”, an entry published on September 28 , 2009 , under the Design categories and Printing, Typography topics.